The anonymous 3rd or early 4th century Greek Life of Polycarp, attributed to Saint Pionius, recounts the life and miracles of Saint Polycarp, Bishop and Martyr of Smyrna, describing him as a holy man and miracle worker, without referring to his martyrdom. It was written in Smyrna of Asia Minor. 1. 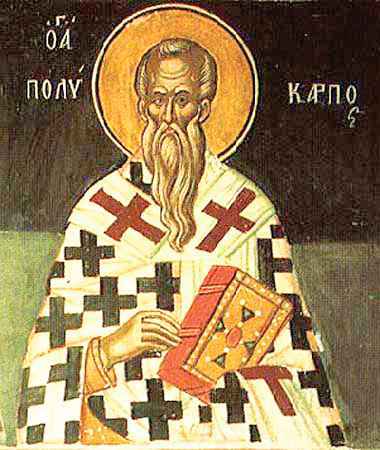 Tracing my steps farther back and beginning with the visit of the blessed Paul to Smyrna, as I have found it in ancient copies, I will give the narration in order, thus coming down to the history of the blessed Polycarp. 2. In the days of unleavened bread Paul, coming down from Galatia, arrived in Asia, considering the repose among the faithful in Smyrna to be a great refreshment in Christ Jesus after his severe toil, and intending afterwards to depart to Jerusalem. So in Smyrna he went to visit Strataeas, who had been his hearer in Pamphylia, being a son of Eunice the daughter of Lois. These are they of whom he makes mention when writing to Timothy, saying; Of the unfeigned faith that is in thee, which dwelt first in thy grandmother Lois and in thy mother Eunice; whence we find that Strataeas was a brother of Timothy. Paul then, entering his house and gathering together the faithful there, speaks to them concerning the Passover and the Pentecost, reminding them of the New Covenant of the offering of bread and the cup; how that they ought most assuredly to celebrate it during the days of unleavened bread, but to hold fast the new mystery of the Passion and Resurrection. For here the Apostle plainly teaches that we ought neither to keep it outside the season of unleavened bread, as the heretics do, especially the Phrygians, nor yet on the other hand of necessity on the fourteenth day: for he said nothing about the fourteenth day, but named the days of unleavened bread, the Passover, and the Pentecost, thus ratifying the Gospel. 3. But after the departure of the Apostle, Strataeas succeeded to his teaching, and certain of those after him, whose names, so far as it is possible to discover who and what manner of men they were, I will set down. But for the present let us proceed at once to Polycarp. One whose name was Bucolus being bishop in Smyrna at that time, there was in those days a certain lady, devout and fearing God, conversant in good works, whose name was Callisto. An angel sent from the Lord stood by her and said to her in a vision of the night; 'Callisto, rise up and go to the gate called the Ephesian, and when thou hast gone forward a little in front of it, two men shall meet thee, having with them a little lad named Polycarp. Ask them, if he is for sale; and when they say "Yes," give them the price that they shall demand, and take and keep him with thee. This child is a native of the East.' Then she, the voice still ringing in her ears and her heart bounding with fear and joy, sat up and arose with haste, and without delay did as she was ordered. And with hurry and flurry she came to the aforesaid gate, and found as the angel told her, and she took him and brought him to her house and delighted in rearing him decently and nurturing him in the nurture of the Lord. And she was amazed, when she saw his intelligence and seemly behaviour and his aptitude for piety. And in point of affection she treated him as a son, while as regards promotion over the servants, gradually as he advanced in age he was made manager of her property. And further she gave into his hand the keys of the storehouses. 4. But when at length it befell that she went away from home for a time, she left Polycarp keeper of her house. And as he went in to measure out rations of food for the servants, he would be followed by widows and orphans and by many of the neighbourhood----all the destitute poor among the faithful----and they would ask to have given them, one corn, and others wine, others oil, and whatsoever each desired. But he, having from a child learnt the lesson of well-doing and having the commandments of God inscribed on the tablet of his soul and on the pages of his heart by the finger of God, even the Holy Spirit, fulfilled the precept, Give to him that asketh thee; and so he emptied all the store-rooms, bestowing lavishly on all that were in need. 5. But when at length Callisto returned after a long time, one of the domestics ran to her and said; 'You, my lady, setting at nought all your servants born in the house, placed everything in the hands of this young lad though he came from the East; and he during your absence from home plundered everything that there was and left nothing.' Then she, being disturbed by the harsh words of the accuser (for the charge was enough to ruffle even a tranquil soul, especially when it conjures up a semblance of pecuniary loss), swelled with indignation in her heart and overflowed with wrath, especially because she held it a very great disaster that one befriended by God and given to her by Him should have squandered everything recklessly; for she did not yet know for what purpose he had employed these goods. Wherefore also very divided thoughts sprang up in her mind. So forthwith she called Polycarp by name, saying, 'Polycarp'; and on his obeying her summons she said, 'Bring me the keys of the closets.' And when he brought them and opened the doors, she went in and began to look round; and a miracle of the mighty working of the Lord Jesus Christ was wrought. For he, when he went in, groaned and prayed saying; 'O Lord God, the Father of Thy beloved Son, that in the presence of Thy prophet Elijah didst fill the vessels of the widow of Zarephath, give ear unto me, that in the name of Christ they all may be found filled.' Accordingly they were all found filled, so that she, thinking the slave had lied, was angry and ordered certain of the domestics [to beat him]. But Polycarp came forward and set himself straight, saying; 'Nay do not ill-treat another for my sake; but rather lay on me the blows intended for him; for he told no lie, but deserveth praise for his affection towards his mistress. But as for me, seeing that I did not spend with an evil intent but on the poor, the God and Father of the blessed Jesus Christ hath both filled the hungry and hath sent His angel to restore to thee thine own, that thou also mayest have to give still to the poor according to the custom which thou followest.' Having heard and seen these things, Callisto was filled with fear, advancing still more in faith and in good works, so that Polycarp became as a son to her; and departing this life in faith she left him her substance. 6. Now after the death of Callisto Polycarp advanced greatly in the faith that is in Christ and that pursues a virtuous life. And in his untiring diligence, he from his Eastern stock bore (if one may so say) blossom as a token of good fruit hereafter to come. For the men who dwell in the East are distinguished before all others for their love of learning and their attachment to the divine Scriptures. So having been brought to Asia and having come by the will of God to live in Smyrna, after making himself fully acquainted with the ways of the people of the country and distinguishing himself far beyond them, he discerned that for every servant of God, while the whole world is [his city], the heavenly Jerusalem is his true father-land; and that here on earth we are bidden to sojourn for a while and not to settle; for we are strangers and visitors. Thus reflecting on this with a godly delight he offered himself day and night wholly and entirely as a consecrated sacrifice to God, exercising himself in the oracles contained in the divine Scriptures and in continual services of prayer and in devotion to all those who needed either attention or relief and in contentment of living. For he a'te such food as came to hand, meagre and simple though it was, and he wore such clothing only as absolute necessity required, for the sake of warmth and of the modest and seemly covering of the body. 7. And for the most part he withdrew into retirement, not appearing in public or conspicuous places, nor where he might reap praise from the spectators. But he spent his time chiefly at home, though sometimes in the suburbs, where he could most easily disregard and escape the turmoil of a great crowd; for he knew that the soul needs tranquillity of sight and hearing flee from contamination with evil things. And in consequence of this he was staid alike in his mental thoughts and in his bodily gestures; for even in youth he had the gait of an elderly man, and his look was manly and unembarrassed by any passion directed towards objects of sight in outward life. But if any of those who met him looked into his face, he would be suffused with a blush, and through his innate respect he made himself respected by others. For the souls of the wise are discerned through the body, as through a mirror, by their blushes. And of those also who came to see him and desired his conversation, he was wont to shun and avoid, if he possibly could, the garrulous and foolish talkers, on the plea that he was intent on some important business and had not noticed the person who met him; but if he happened to get entangled with him, he would answer him briefly just not to seem to be haughty, and then would keep silence. Such was his behaviour towards those from whom no benefit could be got. But bad men he avoided as mad dogs or wild beasts or venomous serpents; for he remembered the Scripture which says, With the innocent thou shalt be innocent, and with the elect thou shalt be elect, and with the perverse thou shalt use perverseness. With those however from whom he could derive benefit he associated very freely, especially in cases where he could reap benefit not only from their words but also from their actions. 8. And as he returned from the suburbs to the city, if at any time he fell in with wood-carriers, especially when they were old men, he had compassion on them for their heavy burden and would attach himself to them and enquire of them if they sold their load as soon as they entered the city; and on their answering that sometimes evening came and they had not succeeded in doing so, he would give them the price and would carry the wood to the widows living near the gate. Thus he gratified the widows with the benefit of the wood, and the woodmen with the enjoyment of their meal at its proper time. 9. Now when he came to man's estate he was more enamoured than ever of godliness; and he discerned that freedom was the proper reward of self-discipline, but that it is attained by few and chiefly by those who have received from God the power of keeping the plumage of their soul unenslaved and unencumbered----men who are privileged to enjoy the free supermundane life through not being dragged down upon the earth by the fetters of marriage. For not one of us can dispense with the necessaries of life; but those persons can least of all dispense with them who harbour in their house an expensive wife that is fond of dress. And he would recount the distractions and annoyances that come from such a wife, rendering it altogether impossible to lead a peaceable and quiet life. For should she be profligate, as Solomon says, the rage of the husband is full of envy; but if she is chaste, she is filled with vanity and is elated in her mind; so that it is better to live in a desert rather than with a contentious and loquacious woman. And altogether no charm of life thrust his soul away from heavenly things; and he was wont to say that the words of Christ and of the prophets and apostles were beautiful to him: Thou art beautiful in thy loveliness beyond the sons of men; grace is shed on thy lips; and again, How beautiful are the feet of those who bring glad tidings of good things. And for the rearing of children and the care for one's offspring and the arrangements at home consequent thereupon, he used to explain how much a man who entangles himself in these matteis must necessarily want, and what distractions and occupations he must have, and what anxieties about their good behaviour, and what burdens fall upon parents when their children sicken and what griefs when they die, and all the other risks which attend the training of their whole life. For at each successive stage of life the young undergo a change of disposition also, the heat natural to their age fermenting like new wine, and seething and purging the material part more and more, like a colt endeavouring to throw off the reins and yoke, until the controlling and superintending mind, by reason and reflexion, as by a bridle, shall pull him back and rein him in and shall put a stop to the neighing, reducing the disorderly and irrational impulse to order. The mind however only then effects this and prevails, when it is penetrated with a certain divine sense and presence of the Holy Spirit. Wherefore also the inspired David supplicated saying, Renew a right spirit in my inmost parts; stablish me with a commanding spirit, and take not Thy Holy Spirit from me; and the Apostle says, Walk in the Spirit, and ye shall not fulfil the lust of the flesh. 10. Our next business after this is to recount also the career of his episcopate, what was his conduct in it and how he attained to it; that by these lessons we may also learn to imitate those who are chosen by God as His ministers. Bucolus then, who was bishop before him, cherished him and set great store by him from his childhood. And being sanguine he entertained great hopes of him, as the fathers of good sons rejoice in having steady successors. And he in turn requited Bucolus, cherishing him as he would a parent, yet not with feigned language but inobtrusively and without forcing himself always upon him; and acting with reserve he observed the opportunities which occurred from time to time, so as not to appear to be officious nor yet neglectful. For he was not eager to give him a present or gift when he could supply his own wants, nor was Bucolus on his part eager to receive one; for the latter regarded the young man's alacrity in relieving those in want as his own personal gain, while the former duly fulfilled the command of the Lord Jesus by giving to those who were not able to pay him back; whereas some persons artfully pursue honour and are ever coveting some other greater honour. While then Polycarp, like Jacob, being a simple and plain man, acted in all things without vanity or ostentation, by the labours of his own hands supplying the poor with bodily ministrations as regards food and other necessaries of life, he gained renown by his actual deeds; and Bucolus was informed of this not by the doer, but by the recipients. For as good men regard the conferring of benefits as imperative, so likewise with reasonable men thankfulness on receiving benefits is indispensable. Moreover he rejoiced to see that many persons who were sick and afflicted with devils were restored to sound health through the grace given to him from God, and so the Lord Jesus Christ was glorified. And he beheld many things also concerning him in visions. 11. He perceived therefore that he was worthy; and for the present, owing to his youthfulness, he enrolled him in the order of deacons with the approval of the whole Church. Blessed indeed was he in being permitted to cover such a head with his hand and to bless so noble a soul with his voice. For the approved and discreet advancement of those who are appointed to an office in the sacred ministry through faith in God is a source of confidence and joy to those who have made the good selection, provoking no blame before men and causing no secret reproaches to the conscience. 12. As a deacon then he approved himself among his own contemporaries, as Stephen did among those of the Apostles; for being well-equipped in speech, and adorned with good deeds, he boldly confuted Greeks and Jews and the heretics. And many a time did Bucolus, by exhortation and encouragement, with difficulty persuade him to allow himself to be disciplined by the Lord and to give catechetical discourses in church. Thus there was given him by Christ in the first place an ecclesiastical and catholic rule of correct instruction; and being able to interpret mysteries which were hidden from the multitude he expounded them so clearly that the hearers attested that they not only heard but saw the things described. He wrote also many treatises and sermons and letters, but in the persecution which arose on his account, when he was martyred, certain lawless heathen carried them off. Their character however is evident from those still extant, among which the Epistle to the Philippians was the most adequate. This we will include in its proper place. 13. But in his teaching his chief point was that his hearers should know concerning God Almighty, invisible, immutable, immeasurable, and that He was well pleased to send down from heaven His own Word and Son, that the Word, thus taking Man upon Himself and being truly incarnate, might save His own creation; and that He, according to the prophecy which had been uttered, being born of an undefiled and spotless virgin and of the Holy Ghost, accomplished that mystery of generation which is difficult of comprehension to most men. And He consented to suffer for the salvation of men, according as Christ Himself declared beforehand by the law and the prophets concerning Himself, as also the Father respecting the Son; whom also God raised from the dead, and His disciples saw Him in the body such as He had been before His passion; and they beheld Him taken up in a cloud of light into the heavens in the same body in which He created Adam before his transgression. But as concerning the Holy Spirit and the gift of the Paraclete and all the other spiritual graces, he would demonstrate that they could not be possessed outside the Catholic Church, just as a limb cut off from a body has no power, proving this from all the Scriptures; such as the saying by the mouth of Daniel, And His kingdom shall not be left to another people, and in the Gospel, Mary hath chosen the good part, and it shall not be taken away from her, and other passages similar to these. 14. But in the matter of continence and virginity he was careful to make hortatory discourses, and he would urge that men ought not of compulsion or by commandment of others, even though they might be parents or masters, but by individual choice and desire, to carry it through as a voluntary effort. And he used to say that chastity was the forerunner of the future incorruptible kingdom, and that it received its name of continence (εὐνουχίαν) because it had much affection (εὔνοιαν ἔχειν) towards the Master, and of virginity (παρθενίαν) because the idea of such self-restraint is with God (παρὰ τῷ Θεῷ); for those who discipline themselves to such a life deaden the carnal fire. And he would demonstrate monogamy from the fact of the creation, pointing out that one woman was created for one man; wherefore also the virgin that is brought to her husband bears her name appropriately: the commencement of the name, he said, signified that she was from God (παρὰ Θεοῦ) and the termination describes her as belonging to one (ἑνός), that is one husband. And he observed that Lamech, being descended from Cain, was the first to take to himself two wives; and by taking to himself is meant doing it not according to the will of God. He said then that, though polygamy was called by the name of marriage, yet it was a specious fornication. 15. And on certain Greeks remarking to him that it was difficult and irksome among the Christians to be able to master the desires, he replied; 'It is foolish to suppose that whatsoever things seem impossible to men are really impossible; but understand that the Lord bringeth about all things, and the Master of the universe subjecteth them to His mighty chariot-reins.' For after setting forth three kinds of chastity, he banished and exterminated fornication from the faithful, and established the rule and sovereignty of chastity; for while the rest of mankind have unbalanced and vague and irregular impulses, and like horses rage and neigh after their neighbours' wives, only those who wait in fear to be judged by the heavenly law and the word of God, which is the avenger and champion of all, are satisfied with a single marriage that exists for the procreation of children. Women in like manner are taught to look only to the husband of their virginity. 16. The second kind of chastity is that of widowhood, transcending the one already mentioned. For the latter seemed to be difficult at first until it was surpassed by that which is able to desist from concessions previously allowed. But the third kind which practises a chastity victorious in every feat----what superiority has it not over the others! What desirable and laudable honour does not belong to the kind of continence and virginity, which shakes off and (so to speak) casts away all the shackles of the lower life, and with light bound and agile step outruns and overleaps the feats already described! For it evinces greater determination in the person who adopts it, than the being content with one alone or the desisting after experience, and it proclaims superior power in God who bestowed it. For that it is voluntary on the part of the man who so chooses, and that it is a gift of God whose is the power, our Saviour showed when He said that men made themselves eunuchs for the kingdom of heaven's sake, and that all men could not receive this word. 17. But as from that time forward he advanced daily in years also, and the flower of a hoary head, the forerunner of old age, appeared, and here and there a white hair began to smile above his temples----for human nature asserts itself not fortuitously, but by a divine providence, and puts forward each development at the proper season as a reminder to the race, and with much grace of wisdom calls the man to perfection by deeds and words; as for instance when it says, How long, thou sluggard, dost thou lie down; and when wilt thou arise out of sleep? or again, Prepare thy works for thy departure; so also by these means methinks it reminds every one of us of the end before it arrives, that the whiter a man's head becomes by time, the brighter his soul may grow by the Word. Bucolus therefore, seeing that Polycarp's age was adequate and that the propriety of his conduct throughout all his life was even more adequate than the number of his years, perceived that he was most excellent as a fellow-counsellor to him in questions relating to the Chinch and as a fellow-minister in teaching; while the Lord set His seal on and ratified his design, giving him commandment in a vision. Accordingly he appointed him to an office in the presbyterate, the whole Church with one accord welcoming him with great joy, although he himself shrunk from such an undertaking. For he said that it was enough in itself to give account of one office and one ministration, let alone of several. And he went on to say; 'If a man being unworthy dareth to lay hold of such an honorable office, he bringeth judgment on himself; but if he be worthy, he has the full reward of his former works, receiving the order of the priesthood as in a manner a reward.' Seeing then that it was impossible to gainsay the counsel and appeal of God, he receives the order of the presbyterate, whereupon he saw a vision and received much comfort. 18. From that time forward therefore, much progress being made in the word of teaching through him, all men glorified our Lord Jesus Christ. For he would extend his discourse to great length on diverse subjects, and from the actual Scripture which was read he would furnish edification with all demonstration and conviction, so that the things spoken were presented to the hearers as if exhibited to the eye. For he was wont to say that the speaker must first believe what he says; seeing that in this way he sets them forth, not as the relation of others, but as achievements of his own. And his voice was grave and manly, with look and gesture corresponding thereto, having sweetness and melody and being pervaded with the fear of God. And on one occasion a person said to him...... for when holding discourse with Jews and Gentiles and with the sects, he would speak loudly, so that some of those standing below could hear him: and for the purpose of showing what things ought to be said with kindliness and not with heat, he would proceed thus; 'How think ye that the Lord spoke such words as these to him that had his hand withered? as the Scripture saith, And looking round upon them He said in anger, Stretch out thine hand; or that saying? O faithless and perverse generation, and other words such as these; or the Apostle Peter? Why did ye conspire among yourselves to tempt the Spirit of the Lord? Or Paul? I would that they would cut themselves off that disturb you. On the other hand when administering comfort, the Lord spoke in gentle language and loving tones; Come, all ye that labour and are heavy-laden. And again with sympathy towards the city of Jerusalem saying, How often would I have gathered thy children, and other words of a like kind. Again Peter with John at the Beautiful Gate addressed the paralytic with pity, and Paul writing to the Galatians says, My children with whom I am in travail again, when the moment for comforting demands it. 19. So also he pursued the reading of the Scriptures from childhood to old age, himself reading in church; and he recommended it to others, saying that the reading of the law and the prophets was the forerunner of grace, preparing and making straight the ways of the Lord, that is the hearts, which are like tablets whereon certain harsh beliefs and conceptions that were written before perfect knowledge came, are through the inculcation of the Old Testament, and the correct interpretation following thereupon, first smoothed and levelled, that, when the Holy Spirit comes as a pen, the grace and joy of the voice of the Gospel and of the doctrine of the immortal and heavenly Christ may be inscribed on them. And he said that they could not otherwise receive the impression of the seal which is given by baptism and engrave and exhibit the form conveyed in it, unless the wax were first softened and filled the deep parts. So also he thought that the hearts of the hearers ought to be softened and yield to the impress of the Word. For he said that it unfolded and opened, like closed doors, the minds of recent comers; and accordingly the prophet was bidden by God, Cry out mightily and spare not, Raise thy voice as a trumpet. What must one say, when even He that was gentler than all men so appeals and cries out at the feast of Tabernacles? For it is written; And on the last day, the great day of the feast, Jesus stood and cried saying, If any man thirsteth, let him come to Me and drink. Yes, for when He is teaching He will cry out, but if He is spitted upon and brought to trial and is tempted and suffers, He will be silent, when He is led as a sheep to the slaughter and as a lamb before the shearer is dumb. For I, it is said, like a deaf man heard not, and I became as a man that heareth not and hath no reproofs in his mouth. 20. The wealth of the grace given by Christ to Polycarp has led us on, while recording his course of life, to explain in turn the character of his teaching likewise. How he used to interpret the Scriptures, we will defer relating till another time, setting it forth in order and showing our successors also how to minister correct instruction in the holy and inspired Scriptures. But for the present we will proceed to speak of the episcopate conferred upon him, and what great things he did when he found himself in this position, running the race of godliness successfully. Bucolus then, forasmuch as the Lord had often signified to him beforehand in visions that he had a man of this kind for his successor, in joy and gladness at leaving as it were a prudent heir, when he went to his rest fell asleep in this manner. At the season of his departure he took hold of Polycarp's hand, and pressed it first upon his own breast, then on his face, signifying that whatsoever graces are ministered through these organs of sense (the heart that understands and the eyes that see and the ears that hear and the nostril that inhales the odour of Christ and the mouth that by speech preaches God the Father and His Son Jesus Christ) will all be committed to him. He then having done this and said, 'Glory be to thee, O Lord,' fell asleep. But Polycarp for the present took no account of any of these things, for his hope and longing was always set on things future. But the believers who were present and standing round, when they saw this, compared notes one with another privately, being hopeful of getting such a man for their pastor. So having taken the body of the blessed Bucolus to Smyrna to the cemetery in front of the Ephesian Royal gate, and placed it where recently a myrtle tree sprung up after the burial of the body of Thraseas the martyr, when all was over, they offered bread for Bucolus and the rest. Now they were all of one mind that Polycarp should offer it; but as he was always scrupulous and desired to yield honour to his superiors, they prevented its happening otherwise. And so he was persuaded and performed the service. 21. And without any delay, not many days after, gathering together bishops from the cities round about and making preparations for the reception of the visitors, they took measures for the appointment of a successor to preside over the Church. When they arrived, great crowds gathered from the cities and villages and fields, some knowing Polycarp, others desiring from what they had heard of him to behold him. So when they were assembled together and the church was filled, the glory of a heavenly light shone among them all, and certain brethren saw marvellous visions. One saw hovering over Polycarp's head a white dove encircled in light. Another beheld him, before he had sat down, as if already seated in his chair of office. A third saw him in the guise of a soldier girdled with a crimson belt. To another again he appeared arrayed in purple, and a sort of light shining about his face; while another, a faithful and reverend virgin, saw him twice his proper size, and a scarlet robe on his right shoulder, and his neck glistening like snow, and a seal upon it. 22. And on the sabbath, when prayer had been made long time on bended knee, he, as was his custom, got up to read; and every eye was fixed upon him. Now the lesson was the Epistles of Paul to Timothy and to Titus, in which he says what manner of man a bishop ought to be. And he was so well fitted for the office that the hearers said one to another that he lacked none of those qualities which Paul requires in one who has the care of a church. When then, after the reading and the instruction of the bishops and the discourses of the presbyters, the deacons were sent to the laity to enquire whom they would have, they said with one accord, 'Let Polycarp be our pastor and teacher.' The whole priesthood then having assented, they appointed him notwithstanding his earnest entreaties and his desire to decline. After this the others also, having made the proper exhortations and appeals on the Sabbath and on the Lord's Day, and offerings and eucharists, rejoicing and partaking of food, returned each to his own home rejoicing greatly at having communicated with Polycarp, and glorifying Christ Jesus the Lord for it, to whom is the glory for ever. Amen. 25. Thus speaking in this way from time to time, and being persistent in his teaching, he edified and saved both himself and his hearers. But I will now record such of the miracles wrought by his hands as have been handed down to us. Once upon a time Polycarp went to Teos, which is near the warm baths commonly called Lebadia, to visit a certain bishop Daphnus by name, who after supper informed him of the scantiness of his means of subsistence, telling him how meagre a supply of food he had reaped from his husbandry. But he, when Daphnus showed him the barrels nearly empty, laid his hands on them and said; 'In the name of Jesus Christ use them freely.' Whence from that hour such abundance was multiplied that, after sowing the land, and providing without stint for his own household, he was able to give to others also. 29. .......as was wont, making no progress for several days, they stopped at length. And when after some trouble those who held the office of councillors were brought together, and the mayor stated that he neither had corn nor could discover whence to buy it, though ready to pay down the money, a certain person, a man advanced in years, rose up from the midst of them and said; 'Sirs, all of you who were present at that season, when the city was endangered from a conflagration which broke out at midnight, remember distinctly how, when neither we nor the Jews were able to extinguish the fire, a man divinely gifted in the lessons of truth, the priest of those who are called Christians, being invited by you, standing before us all and looking up to heaven said some words or other, and forthwith the flame gathering into a ball and paying respect, I know not how, to his voice sunk down into itself; and the thought has often crossed my mind that that man is some god or other. Now you know that our poets and historians say that the heavens send down their gods in the likeness of men, both to punish wrong-doers and likewise also to avenge those who suffer wrong.' But they, when they heard him, shouted out and demanded that a general assembly should be called. So, without delay, they all went off in a body to the theatre; for being distressed by famine they looked to their immediate necessity, since they were compelled to declare, if only by their shout, that there was one God. When therefore they sent for Polycarp and urged him to come, he was found and brought. Then he was conducted to them; and, while the people shouted aloud, the chief men of the city said to him: 'Polycarp, thou seest that the city of which thou also art an inhabitant is in straits, and thou thyself sharest with us and dost participate, if not in our customs, at all events in the scarcity which now exists owing to the drought. The Smyrnaeans therefore urge thee to ask rain of thy God, that the earth receiving water from heaven may return to the husbandmen the seed committed to it.' But his face was covered with blushes, and his whole body dripped like a fountain with profuse sweat, while his heart leaping and throbbing bounded to heaven in prayer. Then slowly, but yet decidedly, he answered saying; 'Sirs, ye who inhabit this most beautiful city, give ear to me a sojourner and a stranger, to whom every city is foreign by reason of my heavenly citizenship and all the world is a city by reason of the gift of God who created all things. For I have not, as ye suppose, so high an opinion of myself that I am able, when a whole nation is justly chastised for its sins, to divest it of its scourges; but how much is possible, I will explain. Gathered together with me are certain venerable old men with whom I myself confer, when I want to ask a thing of God, urging them to be ambassadors on my behalf. With these then I will confer, that they may also be ambassadors on your behalf with Him through prayer; but to you my advice is, that ye be of good courage and order all the people to throw off this distress and to hope for better things. For God, being long-suffering, giveth times for repentance to the race of men.' Then the mayor took courage, as well from the miracles previously wrought by Polycarp himself, as from the words spoken by him, and said; 'Assuredly ye know all of you, citizens and strangers, that while we strive to propitiate the divine being with our own customs and institutions, performing sacred rites and sacrifices and kindlings of altars and burnings of incense, this man and those whom he says he has with him as fellow priests and fellow ministers, retire apart and offer their prayers to their God more leisurely. Let us then separate----we and they----and let us send this man away, offering him security, that dismissing the fear for his life which has overtaken him from this tumult, he may perform his sacred rites on our behalf with his mind undisturbed and his thoughts calmed.' And with these words he dismissed the people.